Moving Nissan&#8217;s headquarters from Los Angeles to Tennessee promises big savings and even bigger changes for employees. FRANKLIN, TN – Sandy’s Downtown Grille is about to greet some new customers. The quaint little pub is located in this historic town 15 miles (24 km) south of Nashville, where a fierce battle was waged during the waning days of the Civil War. Meanwhile, 2,000 miles (3,200 km) away, the Paradise Restaurant, a favorite watering hole near Nissan North America Inc.’s (NNA) headquarters in Gardena, CA, is about to lose some steady clients. Gardena has been NNA’s U.S. home since it entered the market in 1960 with the pioneering Datsun compact pickup. But now it’s packing up to move to the burgeoning Cool Springs area of Franklin, a half hour’s drive from the Smyrna assembly plant that builds the lion’s share of the cars and trucks the auto maker sells in North America. Rumors had been circulating for months, but NNA’s 1,300 Gardena employees still were stunned when it was revealed last November the company would vacate its corporate campus in Gardena, a blue-collar city south of Los Angeles, and head for the hills of central Tennessee. NNA is Gardena’s largest employer, so it’s a big blow to the city of 58,000 that otherwise is sprinkled chiefly with light industry, motels and warehousing. NNA will start construction in Franklin soon on a $70-million new headquarters located on a 50-acre site (20 ha) now populated mainly by scrub pine. It’s scheduled for occupancy by 2008. Meantime, NNA employees will be housed in the BellSouth building in Nashville. The 43-acre (17 ha) Gardena site, containing 13 buildings and 785,000 sq-ft. (73,000 sq.-m) of space, is for sale, but NNA declines to disclose the asking price. 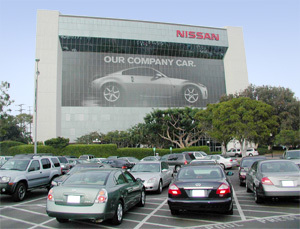 Nissan’s design studio near San Diego will stay put. What makes Nissan’s move so unusual is that California has been a magnet for Asian auto makers since the late 1950s. Toyota Motor Corp., Honda Motor Co. Ltd., Hyundai Motor Co. Ltd. and Kia Motors Corp. all have U.S. headquarters in the LA area. But Nissan’s big move east already is under way. High-level executives went through “familiarization” sessions earlier this year to learn about housing, schools, taxes and cultural activities. And one of the things they have learned is homes can be purchased for half the cost of those they are leaving. One executive who’s relocating to Brentwood, TN, an upscale suburb tucked between Franklin and Nashville, says his new home is twice as large as his California home – but costs the same: $600,000. In Brentwood, TN, the median house value is $313,000; in Franklin it is $184,500. Starting in April, the remaining lower-level employees are scheduled for familiarization visits. Everyone must decide whether to make the cross-country trek by June, after school is out and before classes start in the fall. NNA expects 80%, or 47, of its executive-rank employees to stay on. However, a number of the company’s most senior executives are choosing to leave or retire. Jed Connelly, 60, executive vice president-sales and marketing and NNA’s top American, as well as Jack Collins, 59, vice president-product planning, both have decided to retire rather than move, as well as product public relations veteran Kurt von Zumwalt, 57. Connelly will be replaced by Brad Bradshaw, currently vice president and general manager – Nissan Div. Joy Crose, vice president-legal, and John Rinek, director-media and agency management, also are leaving NNA. “I’ll be 58 when the time comes, and it’s too short a stint (before regular retirement) to make the move,” says von Zumwalt, a 13-year NNA product public relations veteran who also spent 15 years with Toyota. A Los Angeles native, von Zumwalt says he has visited Nashville frequently and “it’s a great town, not stereotypical at all. It’s very cosmopolitan.” His assistant Linda Johnston, with 10 years at NNA, will move to Tennessee. Also making the move is Fred Standish, director-corporate communications, who has ties to the Midwest and once headed NNA’s Detroit PR office. “There are always ups and downs wherever you go, but my family and I are excited about relocating to Tennessee,” he says. “It’ll be a whole new experience,” not to mention perhaps a 15-minute commute vs. up to an hour on L.A.’s clogged freeways. NNA cites surveys indicating that between 40% and 60% of the total current workforce will opt for Tennessee. Based on $197.6 million in tax breaks and other incentives Nissan is getting from the state of Tennessee and local governments, it’s required to employ 1,275 at the new headquarters, which means it likely will be hiring replacements for those staying behind. NNA denies speculation that a chief reason for the move is to cut headquarters payroll. The incentives package includes up to nearly $64 million in “relocation assistance,” or $50,000 for each employee, and $6 million for “temporary office space,” clearly underscoring Tennessee’s serious drive to lure NNA away from California. The seed for that effort was planted innocently enough at a casual lunch in Washington, D.C., in December 2002, says Matt Kisber, commissioner of the Tennessee Department of Economic and Community Development. In attendance were Tennessee U.S. Senators Bill Frist and Lamar Alexander, a former Tennessee governor; and newly elected Tennessee Gov. Phil Bredesen and his predecessor, Don Sundquist. They met to hash over the mid-term November election and invited Carlos Ghosn, then chairman of Nissan Motor Co. Ltd. and now chairman of both Nissan and French auto maker Renault SA, which controls Nissan. “All of them had contacts with Nissan in some way,” says Kisber. Someone broached the idea of NNA relocating to Tennessee, where it already had invested more than $2 billion in Smyrna and an engine and transaxle assembly plant 90 miles (145 km) southeast in Decherd. Smyrna has 6,700 employees and Decherd 1,300. Those prior investments in the state qualified NNA for a “super credit” that applies to the relocation costs, Kisber points out. “Mr. Ghosn was then in the middle of his turnaround plan for Nissan, so we began an all-out effort to show him the benefits of moving the company’s headquarters to Tennessee,” says Kisber. The push included promoting the area’s business climate, quality of life, diversity and “unique aspects,” such as Nashville’s growing reputation as a cosmopolitan center. Nashville, the 23rd largest U.S. city, also has a major airport served by 16 airlines; 19 colleges; two medical schools; and 17 hospitals. Apparently the more Ghosn saw and heard, the more he warmed up to the idea. Ghosn was growing accustomed to making bold strokes. He took plenty of heat in Japan after he arrived in 1999 to engineer a turnaround at then-struggling Nissan by laying off thousands and closing plants. When his plan worked and Nissan began making a strong comeback, he became a hero and one of the auto industry’s most admired top executives. Part of that was wining and dining Ghosn and his team to showcase the region’s attractions. They were feted at President Andrew Jackson’s Hermitage (rural retreat) mansion in Nashville and the colorfully named upscale rural village of Leiper’s Fork southwest of Franklin, where Ghosn reportedly joined the crowd in a rousing round of clog dancing. “We tried to give them a nice sampling,” says Kisber. Besides locating its corporate staffs closer to the manufacturing plants and thereby improving communications and slashing redundancies, the Nashville area also was attractive to NNA because it is located within 700 miles (1,126 km) of 60% of the U.S. population. Costs generally are much lower than in California, and crime is low, too. There were only 58 homicides in Nashville during 2004 (latest available), and none in recent memory in Franklin. Most of NNA’s suppliers already are located in the Midwest. Its technology center is based near Detroit, a short flight away; and it is close to Canton, MS, where Nissan produces Titan fullsize pickups and Armada and Infiniti QX56 SUVs. The company also reportedly is considering building a fullsize van there. With headquarters in Franklin, the distance and travel time to subsidiaries in Canada and Mexico also are shortened. In announcing the decision, Ghosn focused chiefly on economics. “The costs of doing business in California are much higher than the costs of doing business in Tennessee…and that difference is taken into account amid the realities of the fiercely competitive environment in the global auto industry. Tennessee has significantly lower real estate costs and lower business tax rates,” he summed up. That’s backed up by a recent Expansion Management magazine survey of 80 veteran site consultants who were asked to name “America’s 50 Hottest Cities” for expanding or locating a facility. Nashville won the top spot for the second year in a row. Memphis and Knoxville also placed in the top 10, but no California city made the list. When the fun part of the wooing was over, it came down to hard cash. And the state, the city of Franklin and Williamson County (Franklin is the county seat) apparently were in a giving mood. The University of Tennessee studied the economic impact of gaining NNA’s headquarters and concluded that directly or indirectly it would boost income spent in the area by $527 million, increase tax revenues by nearly $24 million annually and produce 13,260 jobs. To achieve that growth, the incentive package – besides covering a substantial part of employee relocation expenses and BellSouth temporary office rent – includes a $23 million “site incentive.” That boils down to $80.3 million for an “enhanced jobs tax credit,” a $5.5-million “headquarters tax credit,” nearly $3 million for “recruitment, screening and training,” $1 million for “fast track job training” and $14.8 million in tax abatements from Williamson County. In its calculations, the U of T study indicates the average salary of NNA employees in Franklin is expected to be $85,000 yearly, compared with $98,000 in Gardena. That estimate reflects generally lower wages in Tennessee and the fact the auto maker will be hiring new people at lower starting wages. NNA employees will enjoy seeing no state income tax deducted from their checks, but they will immediately feel the pinch of state and local sales taxes, which total 9.75% and do not exempt food purchases. As dramatic as it is, Nissan is not alone in making a cross-country move. The Boeing Co. left its home in Seattle for Chicago in 2001, and Ford Motor Co.’s Lincoln-Mercury Div. exited Dearborn for Irvine, CA, in 1998 only to return four years later. Ford’s idea, under then-President Jacques Nasser, was to take L-M out from under Ford Div.’s shadow and beef up Ford’s more upscale vehicles by giving L-M a new start in the nation’s largest car market. But it proved costly. L-M had to build its own legal, human resource and other staffs, and it was far removed from the parent company’s engineering and design resources. So when Ford subsequently acquired Sweden’s Volvo Cars and the U.K.’s Land Rover, says a L-M spokesman, it was time to come home. Even so, Ford’s Premier Automotive Group (PAG), which also includes Jaguar and Aston Martin, remains headquartered in Irvine. NNA will have plenty of automotive company in Tennessee. General Motors Corp.’s big Saturn manufacturing complex is based just a few miles south in Spring Hill, and Ford Motor Credit Co.’s Primus dealer financing organization opened in 1991 and employs 1,500 in its 5-story headquarters close to the NNA site. Franklin, population 48,000, is geographically large, encompassing 30 sq.-miles (77 sq-km) and it’s really three cities. There’s the thriving, charming, historic old city where Sandy’s Downtown Grille is located, dotted with antebellum homes, brick storefronts, 15 antique shops and myriad churches. The city core is about 6 miles (10 km) west of NNA’s site, where numerous new office buildings are located near Interstate 65. In between are familiar chains, such as Wal-Mart, Walgreen’s, Barnes & Noble and every imaginable franchise. But once outside the city, it’s hilly, rural and marked by horse farms and Civil War battle sites. Called “The Gettysburg of the West,” the Battle of Franklin was one of the war’s bloodiest. It lasted only five hours on Nov. 30, 1864. Confederate Gen. John Bell Hood, with 22,000 troops, was determined to take Nashville, but 27,000 union troops commanded by Maj. Gen. George H. Thomas awaited him. It ended when the Yankees withdrew to Nashville, but not before they suffered 2,500 casualties. Rebel casualties totaled 7,000, and 1,496 of those killed – including five generals (but not Hood) – are buried on the grounds of the stately, 1815-vintage Carnton Plantation that today remains a tourist attraction. This history, a mild 4-season climate, good schools, nightlife in downtown Nashville and the area’s scenic landscape are listed by Dan Gaudette, senior vice president of North American Manufacturing and Quality Assurance at Nissan’s Smyrna complex, as reasons why he loves the area. “I like the pace, too. People are very friendly and sincere,” he adds. A transplant from Michigan who once worked for Ford, Gaudette joined Nissan in 1980 as Employee No.16 at Smyrna, starting as an accountant. He now is responsible for the three U.S. plants and two in Mexico. NNA’s shift to Gaudette’s backyard has several advantages from his standpoint. For one, it frees up the few days each month he travels to Gardena for corporate meetings. It also eliminates the 2-hour time difference; improves communications; and brings NNA’s staffs in sales and marketing, product planning, finance, parts and service and other disciplines closer to manufacturing, adding “greater transparency” within the NNA family. Michael Steck, senior director-human resources at Smyrna, anticipates that “all kinds of synergies and collaboration will be possible with the arrival of the California folks,” most of whom have never visited Smyrna before, he says. “There’ll be a lot more cross-functional opportunities, too. Product planning will be a lot closer to manufacturing engineering,” he says. Back in Franklin, the locals are waiting with open arms to say “Welcome, y’all!” The posh, 8-floor Embassy Suites Hotel next to the NNA site has a contract to house NNA visitors and provide meeting rooms (it also has a deal with Saturn). NNA hired Prudential Relocation Services to help acclimate those making the move and providing housing and apartment guidance. Tonya Hamilton, who is in charge of the project, has visited Gardena and says most NNA staffers express interest in schools, housing prices, locales, traffic patterns and commuting times. Some NNA people are keeping their California homes and buying others or renting in the Nashville area, she says. Rebecca Sharber, superintendent of the Williamson County school system, also visited Gardena. “I like this side of the world better,” she quips about Tennessee. Her job was to assure NNA employees that area schools rank high compared with neighboring states, boasting attractive student-to-teacher ratios and solid test scores, and that property taxes are low. “We’re well versed in receiving people,” she says, underscoring that since 1988 the county schools have grown from 18 to 35, with more planned. “We can absorb the newcomers,” she says. In Franklin, 89.3% of those over age 25 are high school graduates, 42.3% have bachelor degrees, and nearly 11% have graduate or professional degrees. The Nashville area has its share of private schools, as well, including the aptly named Battle Ground Academy in Franklin that dates to 1889 and is located on part of the old battleground. Susan Minor, spokesperson for the school, says children of Saturn employees are enrolled there, and NNA families have visited. “They want to know if their kids can get a good safe education and a high quality of life,” she says. Naturally she thinks the academy provides those amenities – at a price. Tuition ranges from $10,000 yearly for the lower school, $12,200 for the middle school and $12,500 for the upper school. Those prices don’t include lunch, but you can always dine at Sandy’s Downtown Grille. Hollywood gore Al Gore Jr.